Yellow chamomile head showing the Fibonacci numbers in spirals consisting of 21 (blue) and 13 (aqua). Such arrangements have been noticed since the Middle Ages and can be used to make mathematical models of a wide variety of plants. Mathematical and theoretical biology is a branch of biology which employs theoretical analysis, mathematical models and abstractions of the living organisms to investigate the principles that govern the structure, development and behavior of the systems, as opposed to experimental biology which deals with the conduction of experiments to prove and validate the scientific theories. The field is sometimes called mathematical biology or biomathematics to stress the mathematical side, or theoretical biology to stress the biological side. Theoretical biology focuses more on the development of theoretical principles for biology while mathematical biology focuses on the use of mathematical tools to study biological systems, even though the two terms are sometimes interchanged. Mathematical biology aims at the mathematical representation and modeling of biological processes, using techniques and tools of applied mathematics and it can be useful in both theoretical and practical research. Describing systems in a quantitative manner means their behavior can be better simulated, and hence properties can be predicted that might not be evident to the experimenter. This requires precise mathematical models. Because of the complexity of the living systems, theoretical biology employs several fields of mathematics, and has contributed to the development of new techniques. Mathematics has been used in biology as early as the 12th century, when Fibonacci used the famous Fibonacci series to describe a growing population of rabbits. In the 18th century Daniel Bernoulli applied mathematics to describe the effect of smallpox on the human population. Thomas Malthus' 1789 essay on the growth of the human population was based on the concept of exponential growth. Pierre Francois Verhulst formulated the logistic growth model in 1836. Fritz Müller described the evolutionary benefits of what is now called Müllerian mimicry in 1879, in an account notable for being the first use of a mathematical argument in evolutionary ecology to show how powerful the effect of natural selection would be, unless one includes Malthus's discussion of the effects of population growth that influenced Charles Darwin: Malthus argued that growth would be exponential (he uses the word "geometric") while resources (the environment's carrying capacity) could only grow arithmetically. The term "theoretical biology" was first used by Johannes Reinke in 1901. One founding text is considered to be On Growth and Form (1917) by D'Arcy Thompson, and other early pioneers include Ronald Fisher, Hans Leo Przibram, Nicolas Rashevsky and Vito Volterra. Several areas of specialized research in mathematical and theoretical biology as well as external links to related projects in various universities are concisely presented in the following subsections, including also a large number of appropriate validating references from a list of several thousands of published authors contributing to this field. Many of the included examples are characterised by highly complex, nonlinear, and supercomplex mechanisms, as it is being increasingly recognised that the result of such interactions may only be understood through a combination of mathematical, logical, physical/chemical, molecular and computational models. Abstract relational biology (ARB) is concerned with the study of general, relational models of complex biological systems, usually abstracting out specific morphological, or anatomical, structures. Some of the simplest models in ARB are the Metabolic-Replication, or (M,R)--systems introduced by Robert Rosen in 1957-1958 as abstract, relational models of cellular and organismal organization. Other approaches include the notion of autopoiesis developed by Maturana and Varela, Kauffman's Work-Constraints cycles, and more recently the notion of closure of constraints. Algebraic biology (also known as symbolic systems biology) applies the algebraic methods of symbolic computation to the study of biological problems, especially in genomics, proteomics, analysis of molecular structures and study of genes. An elaboration of systems biology to understanding the more complex life processes was developed since 1970 in connection with molecular set theory, relational biology and algebraic biology. A monograph on this topic summarizes an extensive amount of published research in this area up to 1986, including subsections in the following areas: computer modeling in biology and medicine, arterial system models, neuron models, biochemical and oscillation networks, quantum automata, quantum computers in molecular biology and genetics, cancer modelling, neural nets, genetic networks, abstract categories in relational biology, metabolic-replication systems, category theory applications in biology and medicine, automata theory, cellular automata, tessellation models and complete self-reproduction, chaotic systems in organisms, relational biology and organismic theories. This area has received a boost due to the growing importance of molecular biology. Computational neuroscience (also known as theoretical neuroscience or mathematical neuroscience) is the theoretical study of the nervous system. Ecology and evolutionary biology have traditionally been the dominant fields of mathematical biology. Evolutionary biology has been the subject of extensive mathematical theorizing. The traditional approach in this area, which includes complications from genetics, is population genetics. Most population geneticists consider the appearance of new alleles by mutation, the appearance of new genotypes by recombination, and changes in the frequencies of existing alleles and genotypes at a small number of gene loci. When infinitesimal effects at a large number of gene loci are considered, together with the assumption of linkage equilibrium or quasi-linkage equilibrium, one derives quantitative genetics. Ronald Fisher made fundamental advances in statistics, such as analysis of variance, via his work on quantitative genetics. Another important branch of population genetics that led to the extensive development of coalescent theory is phylogenetics. Phylogenetics is an area that deals with the reconstruction and analysis of phylogenetic (evolutionary) trees and networks based on inherited characteristics Traditional population genetic models deal with alleles and genotypes, and are frequently stochastic. Many population genetics models assume that population sizes are constant. Variable population sizes, often in the absence of genetic variation, are treated by the field of population dynamics. Work in this area dates back to the 19th century, and even as far as 1798 when Thomas Malthus formulated the first principle of population dynamics, which later became known as the Malthusian growth model. The Lotka–Volterra predator-prey equations are another famous example. Population dynamics overlap with another active area of research in mathematical biology: mathematical epidemiology, the study of infectious disease affecting populations. Various models of the spread of infections have been proposed and analyzed, and provide important results that may be applied to health policy decisions. In evolutionary game theory, developed first by John Maynard Smith and George R. Price, selection acts directly on inherited phenotypes, without genetic complications. This approach has been mathematically refined to produce the field of adaptive dynamics. The earlier stages of mathematical biology were dominated by mathematical biophysics, described as the application of mathematics in biophysics, often involving specific physical/mathematical models of biosystems and their components or compartments. A fixed mapping between an initial state and a final state. Starting from an initial condition and moving forward in time, a deterministic process always generates the same trajectory, and no two trajectories cross in state space. Difference equations/Maps – discrete time, continuous state space. Ordinary differential equations – continuous time, continuous state space, no spatial derivatives. See also: Numerical ordinary differential equations. Partial differential equations – continuous time, continuous state space, spatial derivatives. See also: Numerical partial differential equations. Logical deterministic cellular automata – discrete time, discrete state space. See also: Cellular automaton. Non-Markovian processes – generalized master equation – continuous time with memory of past events, discrete state space, waiting times of events (or transitions between states) discretely occur. Jump Markov process – master equation – continuous time with no memory of past events, discrete state space, waiting times between events discretely occur and are exponentially distributed. See also: Monte Carlo method for numerical simulation methods, specifically dynamic Monte Carlo method and Gillespie algorithm. Continuous Markov process – stochastic differential equations or a Fokker-Planck equation – continuous time, continuous state space, events occur continuously according to a random Wiener process. One classic work in this area is Alan Turing's paper on morphogenesis entitled The Chemical Basis of Morphogenesis, published in 1952 in the Philosophical Transactions of the Royal Society. A model of a biological system is converted into a system of equations, although the word 'model' is often used synonymously with the system of corresponding equations. The solution of the equations, by either analytical or numerical means, describes how the biological system behaves either over time or at equilibrium. There are many different types of equations and the type of behavior that can occur is dependent on both the model and the equations used. The model often makes assumptions about the system. The equations may also make assumptions about the nature of what may occur. Molecular set theory (MST) is a mathematical formulation of the wide-sense chemical kinetics of biomolecular reactions in terms of sets of molecules and their chemical transformations represented by set-theoretical mappings between molecular sets. It was introduced by Anthony Bartholomay, and its applications were developed in mathematical biology and especially in mathematical medicine. In a more general sense, MST is the theory of molecular categories defined as categories of molecular sets and their chemical transformations represented as set-theoretical mappings of molecular sets. The theory has also contributed to biostatistics and the formulation of clinical biochemistry problems in mathematical formulations of pathological, biochemical changes of interest to Physiology, Clinical Biochemistry and Medicine. Theoretical approaches to biological organization aim to understand the interdependence between the parts of organisms. They emphasize the circularities that these interdependences lead to. Theoretical biologists developed several concepts to formalize this idea. For example, abstract relational biology (ARB) is concerned with the study of general, relational models of complex biological systems, usually abstracting out specific morphological, or anatomical, structures. Some of the simplest models in ARB are the Metabolic-Replication, or (M,R)--systems introduced by Robert Rosen in 1957-1958 as abstract, relational models of cellular and organismal organization. The eukaryotic cell cycle is very complex and is one of the most studied topics, since its misregulation leads to cancers. It is possibly a good example of a mathematical model as it deals with simple calculus but gives valid results. Two research groups  have produced several models of the cell cycle simulating several organisms. They have recently produced a generic eukaryotic cell cycle model that can represent a particular eukaryote depending on the values of the parameters, demonstrating that the idiosyncrasies of the individual cell cycles are due to different protein concentrations and affinities, while the underlying mechanisms are conserved (Csikasz-Nagy et al., 2006). By means of a system of ordinary differential equations these models show the change in time (dynamical system) of the protein inside a single typical cell; this type of model is called a deterministic process (whereas a model describing a statistical distribution of protein concentrations in a population of cells is called a stochastic process). To obtain these equations an iterative series of steps must be done: first the several models and observations are combined to form a consensus diagram and the appropriate kinetic laws are chosen to write the differential equations, such as rate kinetics for stoichiometric reactions, Michaelis-Menten kinetics for enzyme substrate reactions and Goldbeter–Koshland kinetics for ultrasensitive transcription factors, afterwards the parameters of the equations (rate constants, enzyme efficiency coefficients and Michaelis constants) must be fitted to match observations; when they cannot be fitted the kinetic equation is revised and when that is not possible the wiring diagram is modified. The parameters are fitted and validated using observations of both wild type and mutants, such as protein half-life and cell size. To fit the parameters, the differential equations must be studied. This can be done either by simulation or by analysis. In a simulation, given a starting vector (list of the values of the variables), the progression of the system is calculated by solving the equations at each time-frame in small increments. In analysis, the properties of the equations are used to investigate the behavior of the system depending on the values of the parameters and variables. A system of differential equations can be represented as a vector field, where each vector described the change (in concentration of two or more protein) determining where and how fast the trajectory (simulation) is heading. Vector fields can have several special points: a stable point, called a sink, that attracts in all directions (forcing the concentrations to be at a certain value), an unstable point, either a source or a saddle point, which repels (forcing the concentrations to change away from a certain value), and a limit cycle, a closed trajectory towards which several trajectories spiral towards (making the concentrations oscillate). A better representation, which handles the large number of variables and parameters, is a bifurcation diagram using bifurcation theory. The presence of these special steady-state points at certain values of a parameter (e.g. mass) is represented by a point and once the parameter passes a certain value, a qualitative change occurs, called a bifurcation, in which the nature of the space changes, with profound consequences for the protein concentrations: the cell cycle has phases (partially corresponding to G1 and G2) in which mass, via a stable point, controls cyclin levels, and phases (S and M phases) in which the concentrations change independently, but once the phase has changed at a bifurcation event (Cell cycle checkpoint), the system cannot go back to the previous levels since at the current mass the vector field is profoundly different and the mass cannot be reversed back through the bifurcation event, making a checkpoint irreversible. 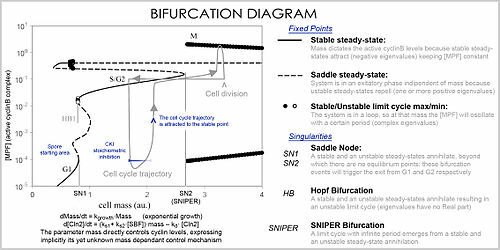 In particular the S and M checkpoints are regulated by means of special bifurcations called a Hopf bifurcation and an infinite period bifurcation. ^ "What is mathematical biology | Centre for Mathematical Biology | University of Bath". www.bath.ac.uk. Retrieved 2018-06-07. ^ Longo, Giuseppe; Soto, Ana M. (2016-10-01). "Why do we need theories?" (PDF). Progress in Biophysics and Molecular Biology. From the Century of the Genome to the Century of the Organism: New Theoretical Approaches. 122 (1): 4–10. doi:10.1016/j.pbiomolbio.2016.06.005. ^ Montévil, Maël; Speroni, Lucia; Sonnenschein, Carlos; Soto, Ana M. (2016-10-01). "Modeling mammary organogenesis from biological first principles: Cells and their physical constraints". Progress in Biophysics and Molecular Biology. From the Century of the Genome to the Century of the Organism: New Theoretical Approaches. 122 (1): 58–69. arXiv:1702.03337. doi:10.1016/j.pbiomolbio.2016.08.004. ^ Robeva, Raina; et al. (Fall 2010). "Mathematical Biology Modules Based on Modern Molecular Biology and Modern Discrete Mathematics". CBE Life Sciences Education. The American Society for Cell Biology. 9 (3): 227–240. doi:10.1187/cbe.10-03-0019. PMC 2931670. PMID 20810955. ^ Baianu, I. C.; Brown, R.; Georgescu, G.; Glazebrook, J. F. (2006). "Complex Non-linear Biodynamics in Categories, Higher Dimensional Algebra and Łukasiewicz–Moisil Topos: Transformations of Neuronal, Genetic and Neoplastic Networks". Axiomathes. 16: 65–122. doi:10.1007/s10516-005-3973-8. ^ a b "Research in Mathematical Biology". Maths.gla.ac.uk. Retrieved 2008-09-10. ^ Montévil, Maël; Mossio, Matteo (2015-05-07). "Biological organisation as closure of constraints". Journal of Theoretical Biology. 372: 179–191. doi:10.1016/j.jtbi.2015.02.029. ^ http://library.bjcancer.org/ebook/109.pdf[permanent dead link] L. Preziosi, Cancer Modelling and Simulation. Chapman Hall/CRC Press, 2003. ISBN 1-58488-361-8. ^ Witten, M., ed. (1986). "Computer Models and Automata Theory in Biology and Medicine" (PDF). Mathematical Modeling : Mathematical Models in Medicine. 7. New York: Pergamon Press. pp. 1513–1577. ^ Lin, H. C. (2004). "Computer Simulations and the Question of Computability of Biological Systems" (PDF). ^ Computer Models and Automata Theory in Biology and Medicine. 1986. ^ "Natural Transformations Models in Molecular Biology". SIAM and Society of Mathematical Biology, National Meeting. Bethesda, MD. 1983. ^ Baianu, I. C. (2004). "Quantum Interactomics and Cancer Mechanisms" (PDF). Research Report communicated to the Institute of Genomic Biology, University of Illinois at Urbana. ^ Kainen, P. C. (2005). "Category Theory and Living Systems" (PDF). In Ehresmann, A. (ed.). Charles Ehresmann's Centennial Conference Proceedings. University of Amiens, France, October 7-9th, 2005. pp. 1–5. ^ "bibliography for category theory/algebraic topology applications in physics". PlanetPhysics. Archived from the original on 2016-01-07. Retrieved 2010-03-17. ^ "bibliography for mathematical biophysics and mathematical medicine". PlanetPhysics. 2009-01-24. Archived from the original on 2016-01-07. Retrieved 2010-03-17. ^ "Cellular Automata". Los Alamos Science. Fall 1983. ^ Preston, Kendall; Duff, M. J. B. Modern Cellular Automata. ^ "Dual Tessellation – from Wolfram MathWorld". Mathworld.wolfram.com. 2010-03-03. Retrieved 2010-03-17. ^ "Computer models and automata theory in biology and medicine | KLI Theory Lab". Theorylab.org. 2009-05-26. Archived from the original on 2011-07-28. Retrieved 2010-03-17. ^ Ray Ogden (2004-07-02). "rwo_research_details". Maths.gla.ac.uk. Archived from the original on 2009-02-02. Retrieved 2010-03-17. ^ Oprisan, Sorinel A.; Oprisan, Ana (2006). "A Computational Model of Oncogenesis using the Systemic Approach". Axiomathes. 16: 155–163. doi:10.1007/s10516-005-4943-x. ^ "MCRTN – About tumour modelling project". Calvino.polito.it. Retrieved 2010-03-17. ^ "Jonathan Sherratt's Research Interests". Ma.hw.ac.uk. Retrieved 2010-03-17. ^ "Jonathan Sherratt's Research: Scar Formation". Ma.hw.ac.uk. Retrieved 2010-03-17. ^ Kuznetsov, A.V. ; Avramenko, A.A. (2009). "A macroscopic model of traffic jams in axons". Mathematical Biosciences. 218 (2): 142–152. doi:10.1016/j.mbs.2009.01.005. ^ Wolkenhauer, Olaf; Ullah, Mukhtar; Kolch, Walter; Cho, Kwang-Hyun (2004). "Modelling and Simulation of IntraCellular Dynamics: Choosing an Appropriate Framework". IEEE Transactions on NanoBioscience. 3 (3): 200–207. doi:10.1109/TNB.2004.833694. ^ "Tyson Lab". Archived from the original on July 28, 2007. ^ Noè, U.; Chen, W. W.; Filippone, M.; Hill, N.; Husmeier, D. (2017). "Inference in a Partial Differential Equations Model of Pulmonary Arterial and Venous Blood Circulation using Statistical Emulation". 13th International Conference on Computational Intelligence Methods for Bioinformatics and Biostatistics, Stirling, UK, 1–3 Sep 2016. pp. 184–198. doi:10.1007/978-3-319-67834-4_15. ISBN 9783319678337. ^ "Integrative Biology – Heart Modelling". Integrativebiology.ox.ac.uk. Archived from the original on 2009-01-13. Retrieved 2010-03-17. ^ "Travelling waves in a wound". Maths.ox.ac.uk. Retrieved 2010-03-17. ^ "The mechanochemical theory of morphogenesis". Maths.ox.ac.uk. Retrieved 2010-03-17. ^ "Biological pattern formation". Maths.ox.ac.uk. Retrieved 2010-03-17. ^ Hurlbert, Stuart H. (1990). "Spatial Distribution of the Montane Unicorn". Oikos. 58 (3): 257–271. doi:10.2307/3545216. JSTOR 3545216. ^ Wooley, T. E., Baker, R. E. Maini, P. K., Chapter 34, Turing's theory of morphogenesis. In Copeland, B. Jack; Bowen, Jonathan P.; Wilson, Robin; Sprevak, Mark (2017). The Turing Guide. Oxford University Press. ISBN 978-0198747826. ^ a b "molecular set category". PlanetPhysics. Archived from the original on 2016-01-07. Retrieved 2010-03-17. ^ Rosen, Robert (2005-07-13). Life Itself: A Comprehensive Inquiry Into the Nature, Origin, and Fabrication of Life. Columbia University Press. ISBN 9780231075657. ^ "The JJ Tyson Lab". Virginia Tech. Archived from the original on 2007-07-28. Retrieved 2008-09-10. ^ "The Molecular Network Dynamics Research Group". Budapest University of Technology and Economics. Archived from the original on 2012-02-10. Edelstein-Keshet, L. (2004). Mathematical Models in Biology. SIAM. ISBN 0-07-554950-6. Hoppensteadt, F. (1993) . Mathematical Theories of Populations: Demographics, Genetics and Epidemics (Reprinted ed.). Philadelphia: SIAM. ISBN 0-89871-017-0. Renshaw, E. (1991). Modelling Biological Populations in Space and Time. C.U.P. ISBN 0-521-44855-7. Rubinow, S. I. (1975). Introduction to Mathematical Biology. John Wiley. ISBN 0-471-74446-8. Strogatz, S. H. (2001). Nonlinear Dynamics and Chaos: Applications to Physics, Biology, Chemistry, and Engineering. Perseus. ISBN 0-7382-0453-6. Bonner, J. T. (1988). The Evolution of Complexity by Means of Natural Selection. Princeton: Princeton University Press. ISBN 0-691-08493-9. Mangel, M. (2006). The Theoretical Biologist's Toolbox. Quantitative Methods for Ecology and Evolutionary Biology. Cambridge University Press. ISBN 0-521-53748-7. Hoppensteadt, F. (September 1995). "Getting Started in Mathematical Biology" (PDF). Notices of the American Mathematical Society. May, R. M. (2004). "Uses and Abuses of Mathematics in Biology". Science. 303 (5659): 790–793. Bibcode:2004Sci...303..790M. doi:10.1126/science.1094442. PMID 14764866. Murray, J. D. (1988). "How the leopard gets its spots?". Scientific American. 258 (3): 80–87. Bibcode:1988SciAm.258c..80M. doi:10.1038/scientificamerican0388-80. Reed, M. C. (March 2004). "Why Is Mathematical Biology So Hard?" (PDF). Notices of the American Mathematical Society.